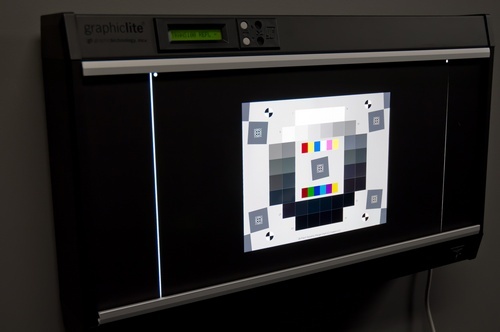 Our image quality test lab facility can offer a multitude of services related to image quality testing and products. We also offer both off the shelf and custom equipment for our customers. This page describes our image quality testing laboratory that is suitable for high volume testing. It will be of particular interest to customers wanting to know what it takes to build an image quality test lab and the equipment necessary to yield high quality, professional results. To obtain high quality illumination covering up to a 40x60 inch (100x150 cm) foam board reflective chart with reasonably good uniformity (>80%) and smaller reflective charts with high uniformity (>90%), we selected a flexible lighting system that utilizes multi-source luminaires and heavy duty, sturdy Munsell N5 coated light stands that can be positioned with ease. These lights can be configured to work anywhere in the world. 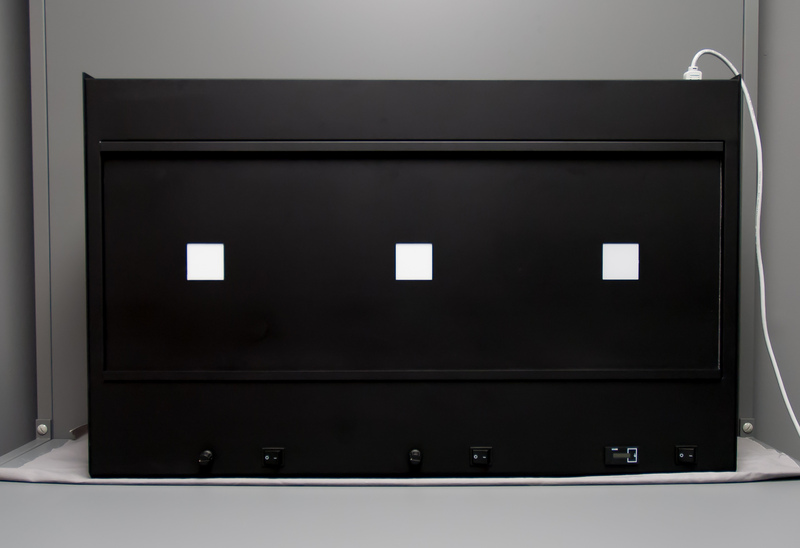 We include these lights in our turn-key test lab setup and offer them as a stand alone lighting system. 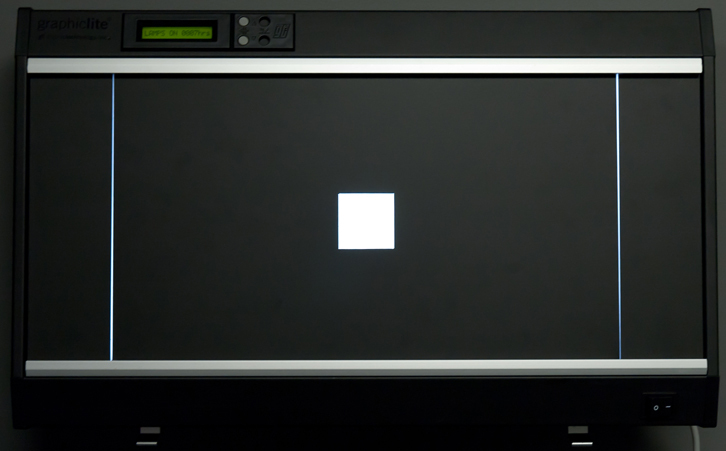 To obtain uniform illumination of transparent test charts, we selected a light viewer that can be configured with different color temperatures and is also equipped with digital dimming to allow us to have control of the light level without the need for neutral density filters. With these viewers in conjunction with our transparent test charts we are able to measure a variety of image quality metrics including: lens/color shading, dynamic range and tonal response. To ensure that we eliminate any movement when capturing images of test charts we tripod mount all devices to be tested. We use high quality Manfrotto tripod legs with a geared head. In our labs, we use the Manfrotto 475B professional tripod legs, with the Manfrotto 410 Junior geared head with the RC4 quick release system supplied with one Manfrotto 410PL quick release plate. We illustrate the Manfrotto components used in our labs, but many more are available to meet special needs. Manfrotto 475B tripod legs with geared center column - supports 26.5 lbs. Height 17 – 74 in. A geared center column is necessary to offer flexibility in chart framing in the vertical direction. The built-in spirit level is valuable for leveling the tripod: If the base (where the head is mounted) is level, fine adjustments are much easier to make because head movements (swivel, etc.) don't interact. The Manfrotto 410 compact geared head with quick release - supports 11 lbs. and is especially nice for making precise adjustments and used the Manfrotto 410PL quick release plate. We keep a couple of these in stock to adapt to different imaging devices for efficient testing. Manfrotto 127VS variable leg spread portable dolly is very useful for keeping legs in place while moving the tripod. Since framing the test targets can be important, especially SFRplus for automatic region detection, we use other accessories that help assist this process. The Manfrotto tripod legs and geared head offer fine tune adjustment and leveling for vertical positioning and for ensuring the imaging device is parallel to the test target. Sometimes we need to also have fine tune adjustment in the horizontal direction as moving the entire tripod can be cumbersome. We use a Manfrotto 454 Micrometric positioning sliding plate to accomplish fine horizontal adjustments. 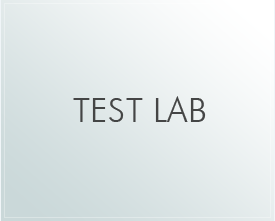 Image Quality Labs also offers application specific training and turnkey Test Lab setups to our customers. If you are interested in learning more about what services we offer and how we can assist you with your image quality needs please take a look at our services page or contact us.